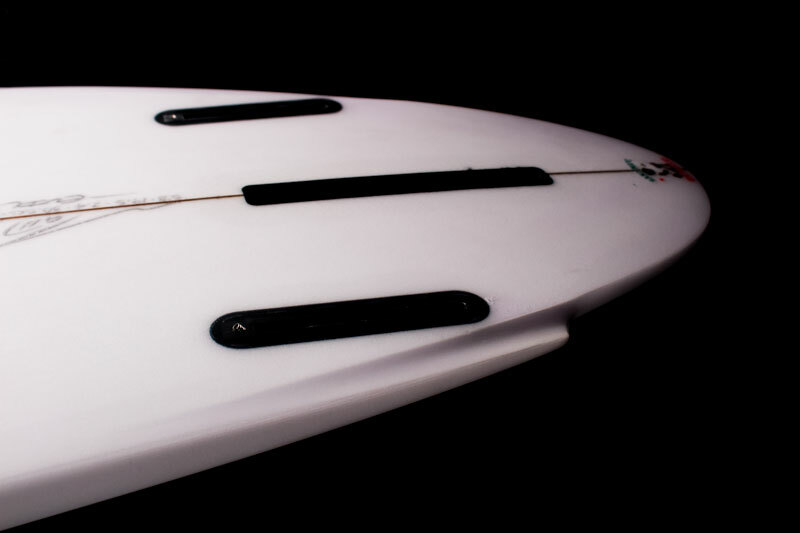 The EVIL TWIN is a Free thinking, transformational toy for the post-modern retro surf world. A fully convertible mash up between Twin fin flamboyance and Single fin flair. • MR inspired Flat deck, and steep, tucked soft, rails, combined with a shallow single concave through the center. • Low tail rocker, with deep double concave vee, which works with the rounded pin tail, to balance speed with control. • Wide forward outline, with low entry rocker, that glides effortlessly. • Single Fin, solo: For minimalist point and glide, soulful arcs and long carves. Lovely in lined up point breaks. Side-Bites engage with the e-wing and raise the performance level. Especially in larger surf. surprises of wider tail twinnies. • Twin + Trailer: Locked and loaded twin fin with overdrive. Confidently carve and surf with power in all sizes of waves. My favorite set up for this board. • Thruster: For all you “Pro-Formance” peeps. Futures offer a rear thruster fin for the long box, which turns the EVIL TWIN into a Terrorizing Thruster. We have worked with Futures to develop both a 6.5” performance “Sinister-Single” Fin and a 3.5” Rear-Trailer Fin, specifically for the EVIL TWIN. Use them in conjunction with any one of Futures’ readily available Twin Fin and Side-Bite options, to create the ultimate transformational fun machine kit… and expand your horizons beyond your wildest dreams.